Four years ago, after watching John Kerry on TV conceding the election, I went into my room, put Barack Obama’s convention speech on repeat, and wept. I’d first watched that speech in Tampa, where friends and I spent a summer outside supermarkets and inside trailer parks registering people to vote. From summer through to fall, we knew we were going to win. We had an endless paper chain of hopeful justifications – another paper endorses the Democrat for the first time in this many elections; another Bush gaffe sure to drag him down; the Tin Man is beating the Scarecrow in a Zogby poll; undecideds always break for the challenger; I canvassed a man today who voted Bush-Dole-Bush be he says it’s time for a change. And that was before the exit polls started coming in. I spent a lot of election day in Philadelphia with college classmates co-ordinating GOTV in a basement, but at one point I stumbled upon a TV somewhere just in time to see Arkansas Governor Mike Huckabee speculating on how John Kerry had carried his state. By the time we were driving back to my parents’ house, there was a steady stream of exit polling, sweet and plentiful like Halloween candy, and I made some snarky comment to a friend about the foolishness of cynical leftists that doubt the essentially good judgment of the American people. Within an hour, the real results were coming in, and our beloved Florida – which we’d sworn we wouldn’t let be lost again by a fraction of a percentage point – went for Bush by five points. Things haven’t turned out that way. John Kerry lost his presidential race, and four years later, Barack Obama is about to win his. Of course, this is a testament for one to the fact that Barack Obama is not as progressive as I and others hoped he might prove to be, or convinced ourselves he was, four years ago. The Obama of The Audacity of Hope has trimmed his sails quite a bit since Dreams From My Father. As much as we may have declared ourselves prepared to be disappointed, it was a let down to see how Obama landed in DC, whether it’s the times he seemed to be acting from political expediency or the times he seemed to be driven by an earnest commitment to disassociating himself from those he sees as ideologues of the left. I would have been shocked in 2004 to hear that Barack Obama would run a presidential campaign in 2008 – and more shocked to hear that he’d be running to the right of John Edwards. 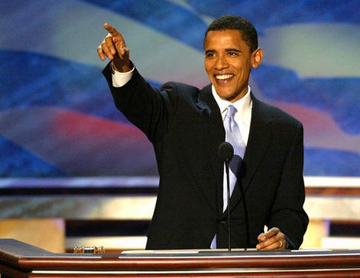 That said, Barack Obama is the most progressive Democratic nominee in my lifetime (so far). He’s run a campaign defining himself first against George Bush conservatism and all it’s wrought, and second against the inertia of Washington and the smallness of our politics, but hardly ever against progressivism or its constituents. He’s vocally defended the need to negotiate with our enemies and the fairness of taxing the rich. He came out early on against California’s marriage ban when the Democratic consultant class would have said to duck and call it a state issue. Maybe most tellingly, when the explosion of Jeremiah Wright coverage posed a maybe mortal threat to his candidacy, he offered a reasoned and provocative speech on race that called on White Americans to understand the roots of Black anger at dreams deferred (then, when Wright basically dared Obama to denounce him, he did so). I always assumed America’s first Black president would be many years in the distance, and that he would look more like Harold Ford – or Bill Cosby for that matter – than Barack Obama. I thought he’d be someone who made a show of talking down to Black people all the time, issued hair-trigger condemnations of Sister Souljahs, and compensated for the perception of otherness with an outspoken conservatism on crime, welfare, and immigration. Instead, we’re about to put a community organizer in the White House who doesn’t apologize for wanting to spread the wealth around. There’s a lot to be said about how this happened. One piece, as can’t be said often enough, is that conservatives were given the car and the keys for eight years to drive the thing off a cliff. Another is that Americans are more progressive on the issues than most pundits think, and this year more than ever there’s an opening for a progressive who tells a compelling story about America and offers confidence and optimism rather than apologies. But another piece of the story is that Barack Obama has realized the promise (speaking of disappointing election days) of Howard Dean’s campaign: a presidential campaign grounded in organizing (but he realized that in Real Life, unlike the internet, you can’t substitute supporters in California for supporters in Iowa). Obama and company started not with identifying supporters, but with identifying volunteers who would find supporters. They inspired, built, and trained a network of leaders ready to push themselves, people in all corners of their lives, and strangers drawn together by a common sense of promise. Let’s see what it can do. This entry was tagged Barack Obama, economy, equal marriage, George Bush, Harold Ford, immigration, John Kerry, media, Mike Huckabee, organizing, race, welfare. Bookmark the permalink. ← WOULD HILLARY CLINTON BE WINNING RIGHT NOW? I’m going to be wearing my Barack t-shirt tomorrow night while I get drunk with a bunch of journalists. Thanks for ordering those.